With a .478 winning percentage across their eight Minor League affiliates, the Phillies ranked 24th among 30 teams in 2013. None of the organization's three Rookie-level teams in the Venezuelan Summer League, Dominican Summer League and Gulf Coast League posted a losing record. By contrast, Lehigh Valley -- which went 72-72 -- was the most successful domestic affiliate but finished 8 1/2 games back in the International League North Division. Clearwater and Williamsport each finished one game below .500, with Reading (.437) and Lakewood (.412) sporting the worst records in the system. While the Phillies appear to be bottom-heavy in terms of prospects, there's actually a steady stream of talent in the pipeline, from Cesar Hernandez in the upper echelons to Dylan Cozens in short-season ball. Then there's the story of breakout prospect Maikel Franco and the even more interesting tale of Luis Garcia, who was working in a barber shop this time last year. Catcher -- Cameron Rupp, Lehigh Valley (53 games), Reading (41 games), Philadelphia (four games): Rupp led all Phillies backstops with a career-high 14 homers and 45 RBIs. The 25-year-old Texan also ranked first among catchers in the organization with 16 doubles and second with 36 runs scored. A 2010 third-round pick, Rupp batted .258 across two Minor League levels before earning a September callup. "Cameron had a real good year, obviously," Reading hitting coach Frank Cacciatore said. "He started in Double-A and made his way all the way to the big leagues. Offensively, I thought he did a really good job cutting down his swing and improving his contact. He used to be a guy that was very long, but he got a lot shorter and showed a lot of power. "[There was a] lot of stuff in his setup, but his rhythm and timing got a lot better. You get better with experience, and at Double-A the pitchers start to work you pretty good. [Lehigh Valley hitting coach] Sal Rende had him at Triple-A and he was very complimentary, too." First base -- Jim Murphy, Reading (139 games): Murphy batted .273 with the Fightin Phils, leading all Phillies first basemen with 23 homers and 83 RBIs, both career highs. In his first tour of the Eastern League, the Washington State University product also ranked first among Philadelphia prospects at his position with 59 walks and 49 extra-base hits. "Jim is a middle-of-the-lineup guy," Cacciatore said. "He is the kind of guy that has an unconventional approach to the ball, but he maintains some consistency with his stroke. He had to work on his rhythm and getting ready early because his natural setup has a lot of moving parts. I thought he did a great job and he finished very, very strong. "Darryl Strawberry had the hands low and he had to get them in the hitting position and he had the leg kick. [Murphy] has the same characteristics, but he's not the same as him. Darryl Strawberry had to work on getting to that good launch position and he had to take a lot of reps to get his timing. We didn't want to take away from [Murphy's] natural tendencies, but we wanted him to shorten up a little bit." Second base -- Cesar Hernandez, Lehigh Valley (104 games), Reading (three games), Philadelphia (34 games): Hernandez's growth continued in 2013 as he ran wild across the International League all the way to the Majors. The Phillies' No. 14 prospect hit .314, which was the highest among full-time second basemen in the system. That led to plenty of opportunities to show off his wheels, which he did by collecting 33 steals and nine triples, both the best tallies at the position. At the big league level, the 23-year-old batted .289 with 10 RBIs and 17 runs scored in 121 at-bats. "Cesar had a real solid year offensively," said Phillies director of player development Joe Jordan. "I was really happy with every aspect of his game. He hit for a good average and he stole bases. He's 23 years old and he hit over .300 in Triple-A. "He did a lot of good things and we were pleased with the year he had. Cesar can play every day second base in the big leagues now. Obviously, we have Chase Utley on our Major League team, and that was a big part of the reason why we put him in the outfield some." 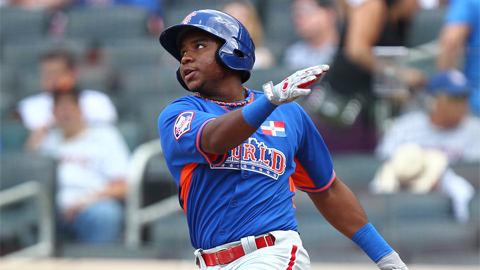 Third base -- Maikel Franco, Reading (69 games), Clearwater (65 games): MiLB.com's Breakout Prospect of the Year, Franco led all Minor Leaguers with 308 total bases. He hit 31 homers and plated 103 runs -- both of which ranked first in the system -- and he was one of only four players to produce a 30/100 season. The 21-year-old also smacked 36 doubles and scored 89 runs, more than any other corner infielder in the system. "You can't say enough," Cacciatore said. "He came up to Double-A and he was full of confidence. He made the All-Star team at the Florida State Leeague and the big thing he did was that he stayed aggressive to the fastball and consequently showed that he could hit it. For a first-year guy coming up in the middle of the season and making that transition, he was very impressive and very exciting." Shortstop -- Jonathan Roof, Clearwater (68 games), Lakewood (16 games): As a member of the Padres organization, Roof reached Triple-A Tucson in 2012, spending 49 of his 81 games in the Pacific Coast League. And while this season did not start quite as well for the former Michigan State standout -- he was released by San Diego in January, then traded from the Tigers to the Phillies two days before Opening Day -- it ended on a positive note. Roof led all Phillies shortstops with six homers and 42 RBIs and ranked second with 47 runs scored (Angelo Mora had 50). His .381 slugging percentage and .702 OPS were both career bests. "We picked him up in Spring Training and he did a good job for us this year," Jordan said. "He did a fine job at shortstop and he caught the ball. He might not have quite the range of some of the other guys, but he did a very good job for us. He was a good acquire for us." Kelly Dugan, Reading (56 games), Clearwater (56 games): Dugan hit .291 between the Florida State and Eastern leagues in 2013. His 20 homers and 217 total bases were tops among Philadelphia outfielders, and he ranked second with 59 RBIs, one shy of a career high. A 2009 second-round Draft pick, Dugan produced a .291/.352/.506 slash line that was similar to the .300/.387/.470 marks he posted as an Organization All-Star in the South Atlantic League 12 months ago. "He has an unconventional approach to the ball, but he has a good feel for the bat head and where the ball is," Cacciatore said. "He has good hand speed ... and good power potential, but he is more than that -- he's a good hitter. He has a good work ethic ... and if he continues to follow the path he's on, he'll have a high ceiling. "He made some adjustments and really did a nice job controlling his stroke and staying in the middle of the field. When he came up, he was looking to pull the ball, so pitchers started pitching him away. But he made the adjustment and started showing power to the opposite gap." Aaron Altherr, Clearwater (123 games): Altherr showed a mixture of pop, speed and production in center field for the Threshers. He batted .275 and led all Phillies outfielders with 69 RBIs and 23 steals. His 36 doubles also ranked first, while his 12 homers placed him fourth. The Phillies' 18th-ranked prospect established career highs in almost every offensive category, including homers, RBIs, extra-base hits (54), total bases (212), walks (45) and slugging percentage (.455). "Aaron Altherr put himself on the map this year," Jordan said. "He's just been trying to find himself and this year he played really well. He's an above-average defender at all three spots and the thing we were most excited about was that he hit .275 in a full-season league in the Florida State League, which is a tough league to put up offensive numbers." Dylan Cozens, Williamsport (68 games): Selected in the second round of the 2012 Draft, Cozens stepped up to the New York-Penn League and improved on his numbers from the GCL a year ago. Philadelphia's No. 17 prospect smacked nine homers, 19 doubles and two triples in 245 at-bats, hitting .265 and stealing 11 bases in 17 tries. He had a .982 fielding percentage after committing two errors in 112 chances. "This kid was a two-sport athlete in high school. He was a 2012 draftee, so he's only been with us a year and a half," Jordan noted. "Dylan is learning the game and the subtle things like how pitchers pitch him. "He's gone through a lot of that type of process, but the more he plays and the more professional at-bats he gets and the more professional situations he faces, he has a chance to be a heck of a player and the chance to be a very dangerous offensive player." Utility -- Cody Asche, Lehigh Valley (104 games), Philadelphia (50 games): The 23-year-old third baseman, a standout in the Arizona Fall League in 2012, hit .295 with a career-high 15 homers and 68 RBIs in 404 at-bats with the IronPigs. His 196 total bases ranked seventh in the organization and he chipped in 11 stolen bases in 14 attempts. Despite missing around 100 Triple-A at-bats following his callup to the Majors in July, Asche was still named an IL postseason All-Star. "He has made himself a very good defensive player at third base and he's always been able to hit," Jordan said. "I just think when you look at what he was able to do at Triple-A in 400 at-bats, he had over 40 extra-base hits. "He ran out of gas a little bit at the end, but the guy's an all-around player. He can steal a base and play good defense and he's smart of the basepaths and he can hit. Power will continue to come with him. He's a solid guy, great makeup and as good a worker and as good of an intangibles guy as we have." Right-handed starting pitcher -- Drew Anderson, Williamsport (15 games): Selected in the 21st round of the 2012 Draft, Anderson led all qualifying Phils starters with a 2.00 ERA, almost a full run lower than Mario Hollands, who ranked second with a 2.86 mark. Anderson, who turns 21 in the spring, struck out more than twice as many batters (54) as he walked (20) and held New York-Penn League opponents to a .214 average. Over 76 1/3 innings, the Nevada native went 6-3, one win shy of tying for the league lead. "Drew had a good year and he's a kid that is very confident in his ability," Jordan said. "He's young and he's still figuring some things out, but he doesn't pitch with any fear. He attacks hitters with his fastball, his breaking ball is improving and he's starting to use his changeup. "He's set the groundwork for some good things going forward. He's done everything he needed to do for a year and a half and he's ready for a full-season league." Hollands ranked second in the organization with a 2.86 ERA and third with 114 strikeouts across two levels. He went 4-1 with a 1.56 ERA in the Florida State League and was 3-2 with a 4.31 ERA in Reading. His seven wins tied a career high while his 132 innings pitched and 114 strikeouts were also personal bests. "Mario is a guy that has probably had to prove things along the way a little bit more than some guys, but every time someone tells him he can't do something, he goes out and proves them wrong," Jordan said. "He's been kept in extended [spring training] a couple times as we let a couple other guys break camp with full-season [teams] ... but once he got his opportunity, he has gone out and performed and put himself in good standing over here." Relief pitcher -- Luis Garcia, Clearwater (14 games), Reading (11 games), Lehigh Valley (eight games), Philadelphia (24 games): A native of the Dominican Republic, Garcia had a successful return to pro ball in the U.S. in 2013. Before this year, Garcia was last seen in Class A Advanced Potomac, the Nationals' Carolina League affiliate, in 2010. In the two years that followed, he taught baseball at children's clinics, struggled in the Canadian-American Association and worked as an apprentice barber. With the Phillies, the 26-year-old right-hander shined. He saved 11 games -- tied for the most in the organization -- across three levels and appeared in 24 Major League contests. Garcia went a combined 2-2 with a 1.51 ERA over 41 2/3 innings, striking out 41 batters against 12 walks and holding opponents to a .237 clip. "I don't know if there's a better story in the game or if any story is more intriguing or interesting than his," Jordan said. "The guy has a great arm and he basically got started with his fastball and he made progress with his slider. "From the Florida State League to Reading, I saw a big improvement in his slider, and really the same thing when he went to Triple-A. We pushed him, we were aggressive, but he answered the challenge every step of the way."